Poverty and hardship could not stifle the inventiveness of Irish cooks who cooked with what little they could find. But although much of it was frugal food, the rivers teamed with wild salmon, The loughs ( pronounced locks ) of the West were full of eels, wild fruits grew by the roadside and wild garlic still grows naturally and was frequently used instead of onions. I have tried to include just a few of the more unusual dishes rather than Irish Stew or Soda Bread. Fancy food it isn't but delicious it is. I was brought up on this sort of Irish food. I am just giving a few examples . Boil up the vegetables and chicken in a pan until cooked . Mix the yolks and cream together and add at the end of cooking . Heat through. This is made using left over mashed potatoes and left over cabbage. Fry over some onions and add to the left over mash and cabbage mixture. Add them to a dish with a little warmed milk. Serve with a little butter on top. A boxty is a potato pancake, add mashed potato to a buttermilk pancake mixture and fry over in the usual way. My dad's family were from Castleconnel Limerick so this is special to me. Two cups of flour, one cup of sifted sugar, three eggs, scant one-half cup milk, four ounces of butter, one cup of currants, one teaspoon baking powder, one teaspoon of mixed spice, one-half cup sultanas, two ounces of candied peel (can be omitted). Rub the butter into the flour, sprinkle the baking powder over this, add all the rest of hte dry ingredients, mix with the beaten yolks of the eggs thinned with the milk, and then fold in lightly the well-whisked whites. Put in a cake tin well-greased and lined with paper and bake in a moderate oven an hour or more. Try at the end of an hour, but it may not be done for fifteen minutes longer. This only one, a good one, of the many currant cakes so popular in the British Isles. The recipe of which this is an adaptation used two ounces of lard and two of butter. Bake for 1- 1 1/2 hours. The" Ulster FRY" or "Full Irish " are the names used for a massive cooked breakfast although in Ulster ( N Ireland ) it can be eaten throughout the day. The Full Irish would consist of bacon, fried eggs, fried sausages, white pudding, black pudding, tomatoes. mushrooms, beans soda bread and hash browns. In the Ulster Fry it would be similar to the Full Irish but it would be served with soda farls shallow fried and no black pudding. I am always looking for new Irish recipes and these look delicious. Divide the mixture between the mushrooms and bake in a shallow dish in a moderate oven for 20 minutes. This is a new to me but I shall be giving it a try. Oats are very healthy food. This is a traditional chunky soup but could be blended if you want it smooth. Heat stock and milk and add oatmeal. Simmer gently. Fry the leeks gently in the butter . Add the leeks and potatoes to the oatmeal mix and stir. Cook for 20 minutes, stirring occasionally but don’t boil . Just before serving add the chopped spinach and stir . Season with salt and pepper and serve with a swirl of cream if desired. My Ulsterman nephew in law David gave me this recipe for an Ulster Warm Potato Salad so I have added it here for you. It is very healthy as it contains no mayo ! Scrub the potatoes and do not peel them. Boil them in water for about 20 mins. This is very good if you can't stomach yeast. Mix all the dry ingredients together and then add the liquids and stir. Pour the mixture on to the top of the apples and spread out evenly . Sift the dry ingredients together. Add the liquid and mix well. put in a well greased 2 lb loaf tin. It will just fit into a 1 lb deep loaf tin. Cook in a hot oven (200c) for 15 mins. Turn down to 150c and cook for a further 25 minutes." I had this today at a fantastic little pub in Glossop, Derbyshire, " Hare and Hounds " . It is delicious. This is my take on it and not the marvellous chef's recipe. It takes less than ten minutes. Wexford Beef is prime strips of beef, in red wine, onion, multi-coloured peppercorns and cream. Cut 1lb of best quality beef steaks into strips. Season them with salt and fry them over quickly in some oil with the sliced onions. Add red wine and peppercorns to the pan and bubble the mixture for 2 minutes. Turn heat down , stir and add the cream. Heat through but don't boil. Serve immediately. This is a very popular cake in Ireland and there are many variations of it. Soak the fruit in whiskey and orange juice over night so the fruit swells up. Put the mixture in a cake tin and cover with paper . Bake for about one and a quarter hours on 350F/180C/Gas4. Bacon Broth is popular all over Ireland but this one is a take on my favourite Irish chef 's Rachel Allen 's recipe. The woman is a star! The bacon or ham is diced in this recipe. It is a meal in itself. Stir in the cabbage just before serving. Serve with chunks of soda bread. Bacon and cabbage have always been a popular combination in Ireland. I do like the sound of this Cork Broth and will try it soon. This bacon and cabbage broth sounds useful, though my stocks of cabbage have nearly run out.I was talking to Constancia, my daughter-in-law, today about what she wants me to grow next year, and she tells me that she will always use cabbage. I have added a warming bacon and cabbage broth/ thick soup to the list. Bacon broth is found all over Ireland but this one is from the very south. Perfect for cold winter days like today. It has been a great experience finding old recipes and assembling it here. This page generates thousands of visitors. It is the type of food we were raised on and then Frank married into an Irish family too. it has done us good as we are all in pretty good health. WOW this is way more than soda bread. I love a good boxty, my Grandmother made them all the time as well many others you have included, love the apple cake too. This is a wealth of cooking information. I have eaten Irish whiskey cake, and I quite liked it. In the run up to Christmas, I have added Irish Whiskey cake to my Irish Recipe page above. With its orange juice and Irish Whiskey, it is delicious for an Irish themed Christmas. I've added another recipe above, one which I sampled yesterday. 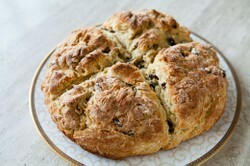 Frank Beswick has found a recipe of Irish wheaten bread which is a brown soda loaf found in N Ireland. He sent it me and I am happy to reproduce it above. The Stockport Riots of June 1852 made national and international news and were based on racism and religious bigotry. 200 years ago Christmas Day was hardly celebrated at all. In England it was seen as just another day. So what brought about the change in the 19th Century ?